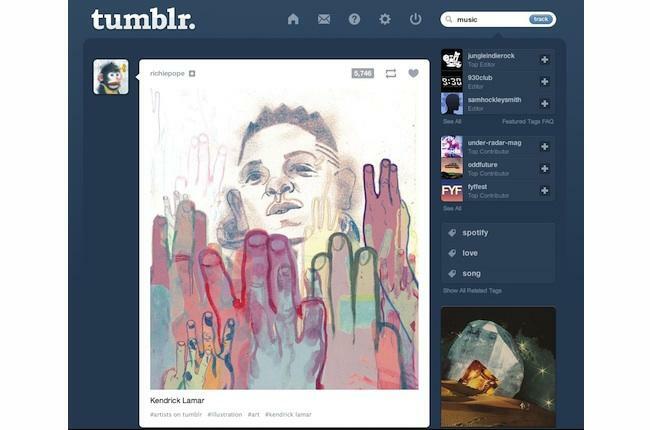 Blogging site Tumblr is getting into music discovery. At the core of the blogging company's strategy will be a select group of editors that share music, video and pictures with the site's 95 million users. "This is our destination for users to discover music on Tumblr," says Nate Auerbach, Tumblr's music evangelist. Tumblr could have considerable power as a new music discovery destination. The site had 30.8 million U.S. unique visitors in December, according to comScore, making it the 38th most visited web property in the country. That traffic will be combined with content hand-picked by dozens of experts. There are two aspects to Tumblr's entry into music discovery. First is the tag page. A visitor can see music tags by typing in "music" in the search field at the top right of the Tumblr page. Music will also be added to Tumblr's "explore" page along with many other tags. Like other categories on Tumblr's explore page, music will have tag editors that highlight the best music, videos, artwork and photos. Because editors are members of the Tumblr community, content comes from trusted experts, rather than Tumblr itself. As of Thursday there are about 20 editors -- more will come -- ranging from concert venues such as Washington DC's 9:30 Club and Los Angeles's The Echo to journalists, bloggers and VH1. The page has been in beta for two months. Auerbach says tag editors were chosen because they have a significant following or respect in their various fields and represent music diversity. Some are native Tumblr bloggers. "These are all trusted brands," he says. Many other categories, from basketball to menswear, already have editors but music is a late arrival. Auerbach explains that Tumblr has picked the music tag editors carefully in order to respect copyright. Editors will understand what kind of content can and cannot be shared to the music page. "Before me there wasn't anyone who could speak to the intricacies of the way the music industry works, and there wasn't anyone who could police how the tag editing works," says Auerbach, who joined the company in May 2012 after stints at artist management company the Collective and MySpace. The second aspect of Tumblr Music is a blog at music.tumblr.com, where Tumblr will post announcements related to music. Recent posts include a flyer to the company's March 15 party at SXSW and just-announced Fall Out Boy tour dates. It's not a place for Tumblr to put out an editorial voice because it's leaving the editorial voice to its users, says Auerbach. Both the music tag page and the Tumblr music blog will be available to mobile and non-Tumblr users as visible content. However, the only way to interact with the posts and get the full experience will be to log in as a Tumblr user.